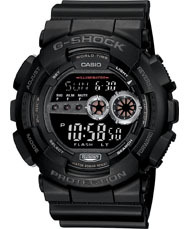 Based on the successful analog/digital GA100 X-Large G Series, G-Shock an all digital version large size and wide face not only give a look of power and strength, but make it extremely easy-to-read and use with its oversized buttons. For added visibilty in dark conditions, a newly designed high-density LED light has been employed to light up the dial face from behind. The result is a super luminous display that's a true reflection of G-Shock's desire to keep improving timekeeping.